Comics on the Brain loves children’s books. They offer a sense of fun that many modern comics don’t offer. We see in them the exuberance that once existed in American comics, but one that has trickled away over the years as the industry has become more and more geared to the adult’s buying comics, not the kids that were once the lifeblood of the medium. So it’s always fun to find a book that captures the love of living. You know, the exuberance of just soaking it all in. And more often than not, you can find that in a children’s book — from books published today or those from the past. 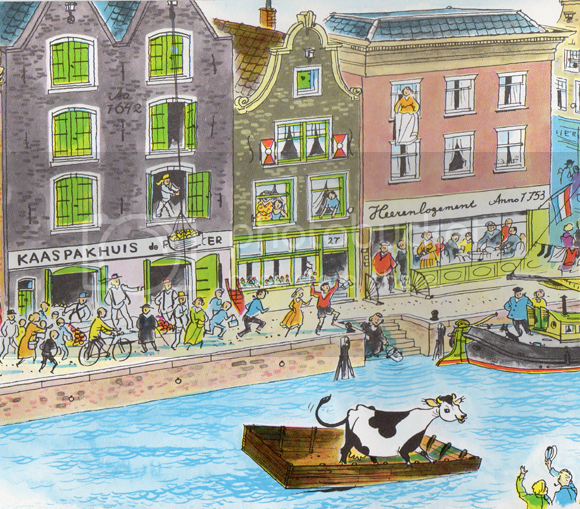 The children’s book we’re talking about is from yesteryear: “The Cow Who Fell in the Canal” is written by Phylis Krasilovsky and drawn by Peter Spier. It captures that pleasant zeal of life we so enjoy. Originally published in 1953, “Cow” tells the story of Hendrika, the titular cow, who is quite bored with her lot in life in the pastures of Holland. She wanders a little too close to the canal leading to town and falls into its waters. She waits around for a while to be rescued, and when no one seems to notice her peril, she climbs aboard a barge and rides it into town. From there, we see a whimsical adventure unfold as Hendrika sees the world, or at least what she can from aboard a skiff floating down a canal in Holland. Spier manages to keep the theme of exploration interesting, as we see different views of his home country — from windmill-capped farms to the quaint architecture of the city. The streets aren’t empty either, nearly every scene is teeming with action and amusing asides. And all the while, we see Hendrika calmly smiling as she takes it all in as her merry journey continues. She isn’t panicking, so we, the reader have no need to panic. That’s the kind of story everyone should read before going to bed at night. COMIC BOOK-NESS: Not a comic, but the linework reminds one of European comics from the middle of the 20th century. Crisp and light. Theirs plenty of action going on around the cow, which might be fun. WOULD IT BE A GOOD MOVIE? A short, sure. A whole movie would be stretching it a bit.